Since becoming a mom my dedicated craft time has been pretty much non existent. I’ve been able to steal a selfish evening here and there but for the most part my time is split between cooking, feeding, cleaning and diapering. But now that my little one is 10 months old, day time play time is becoming more independent – opening the door for me to pick up some little project that I can work on in 5 minute intervals while Nora is distracted by the empty fedex box or engrossed in one of the foam books Aunt Carla brought over for her to ‘read’. So the question is…. What can I do that takes almost no concentration at all, that uses few or no dangerous tools, that I can just drop if I need to rescue my wee baby (or I just need to tickle that little tummy), and that fulfills my need to make stuff?? 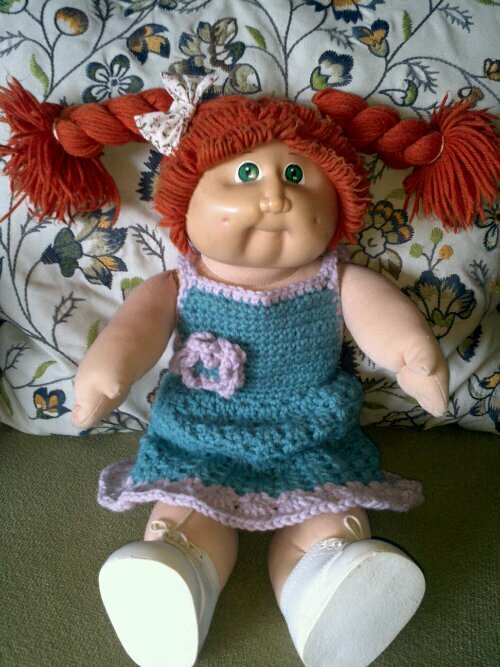 The answer… crochet outfits for my cabbage patch doll, Corine. I call this one “A Garden Party”.